A new iPhone App with the misleading name ‘PatriotApp’ attempts to draw on the power of the patriot movement, turning smartphone users into a gigantic snitch network. You might think an app with such a patriotic name might have useful functions like a pocket constitution or quotes from our forefathers. But contrary to the services one might expect, this app allows users to report any ‘suspicious’ behavior directly linking them with top government agencies. PatriotApp encourages active citizen participation in the War on Terror and in protecting their families and surrounding communities. 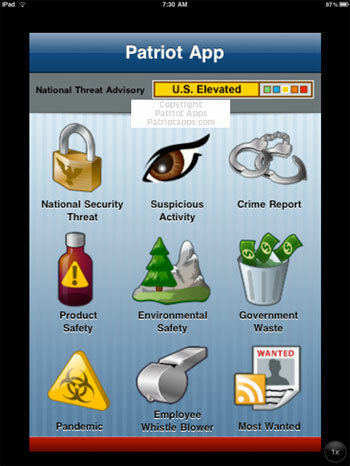 An app like this is meant to solidify the climate of fear in which our leaders want us to exist. The threat of terrorism must be palpable in order for the ‘War on Terror’ to be justified and to validate all the extreme measures instituted in its name. Watch video of Alex Jones exposing other government programs meant to turn average citizens into snitches in the ever expanding control grid.